Thoughtful, theatrical, and provocative, Love is a Thug is a celebration of the craft and creativity of conceptual artist Scott Young, challenging visitors to reexamine their relationship with romance. Loveland is a town intrinsically linked to sentimental and idealistic notions of love. Each Valentine’s Day, thousands of cards are sent to Loveland to be stamped with the special love-themed postmark created anew each year. Hearts with loving messages are mounted on light poles throughout the city. Miss Loveland Valentine reigns over the sweet mayhem. In an effort to balance this rabid bid for a classic, yet often unrealistic myth of love, Loveland Museum presents an exhibition that reflects a contemplative and honest assessment of this pining for relationship and the challenge of linking yourself to an unknown, with all the resultant power struggles. 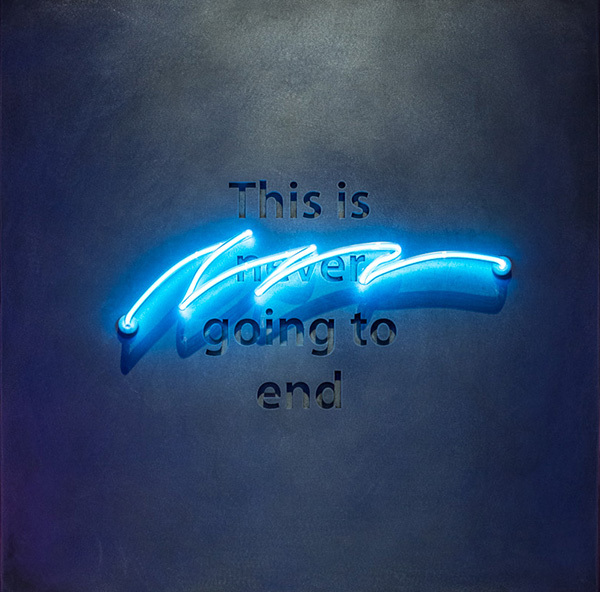 Scott Young is a Denver-based artist who works with neon and text to create thought-provoking artwork that challenges viewers to engage with and question the modes by which we co-exist and strive to relate with one another. Young is represented by K Contemporary in Denver, Colorado. Share and release your own brokenhearted stories in our Broken Heart Interactive. If sharing your story isn’t all roses, enjoy artwork by Scott Young, drinks from Dark Heart Coffee, and some Slam Poetry.